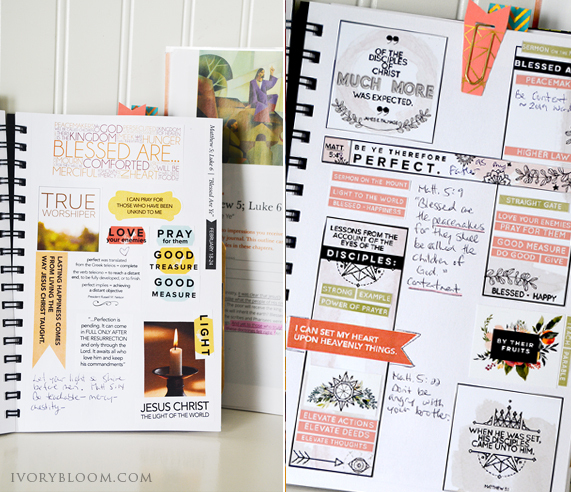 Studying the scriptures as a family can be a delight with preparation and creativity. 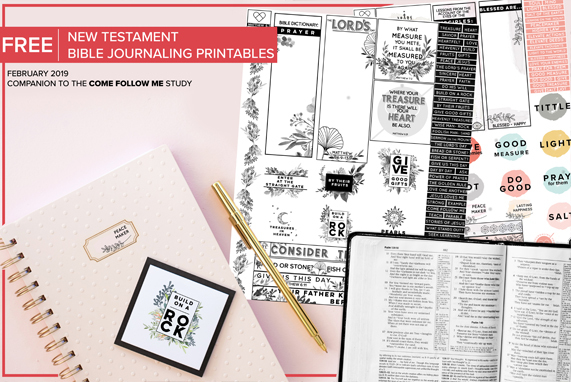 Use these ideas to supplement your study of the New Testament. 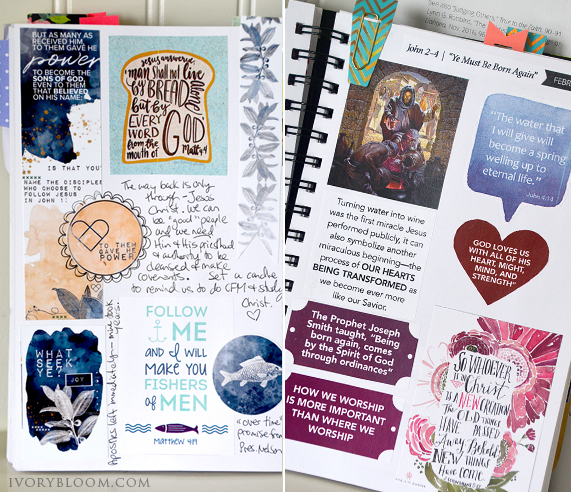 I've been using printables from Rhonna Farrer (FREE download) and The Red Headed Hostess (small subscription fee) in my bible journaling pages. Here are some printables to help you and your family. 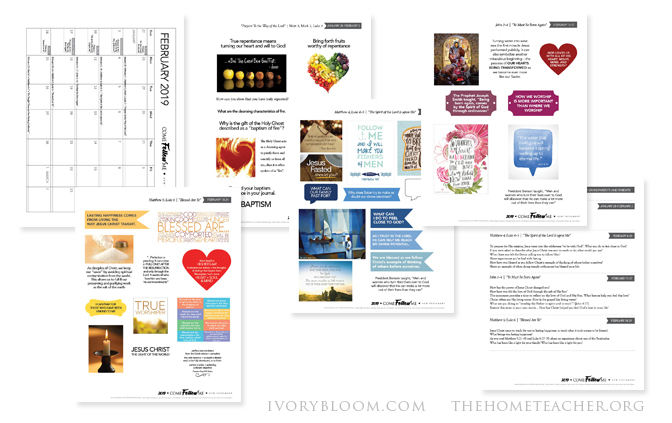 Download the February Ivory Bloom 2019 Come, Follow Me printable (includes calendar, bible journaling pages, and questions for grandparents). 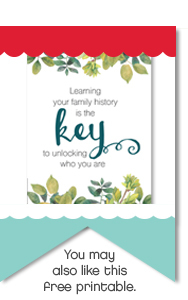 Rhonna graciously offers her printable for FREE from her website. To prepare for His mission, Jesus went into the wilderness “to be with God”. What you do to feel close to God? If you were asked to describe what Jesus Christ was sent to earth to do, what would you say? When have you felt the Savior calling you to follow Him? Share experiences you’ve had with fasting. How have you blessed as you follow Christ’s example of thinking of others before ourselves? 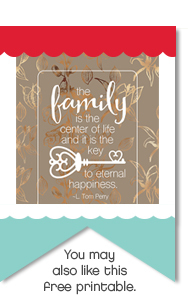 Share an example of when doing temple ordinances has blessed your life. How has the power of Jesus Christ changed you? How have you felt the love of God through the gift of His Son? The sacrament provides a time to reflect on the love of God and His Son. What hymns help you feel this love? 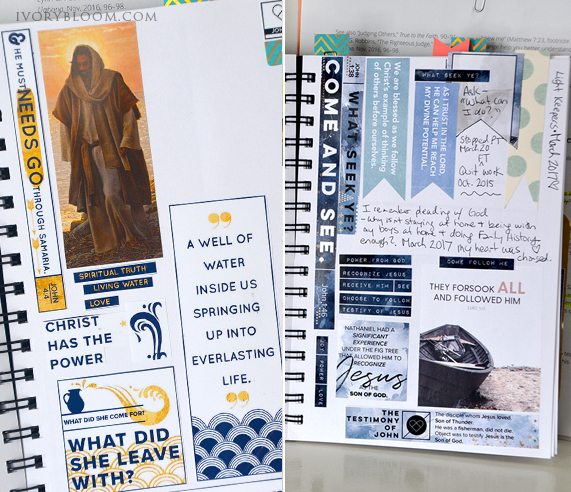 Christ offers me His living water. How is the gospel like living water? What are you doing to “worship the Father in spirit and in truth”? (John 4:23). Restate this verse in your own words... How has Christ helped you feel God’s love in your life? Jesus Christ came to teach the way to lasting happiness, to teach what it truly means to be blessed. What brings you lasting happiness? As you read Matthew 5:21–48 and Luke 6:27–35; share an experience about one of the Beatitudes. Who has been like a light for your family? Who has been like a light for you?